For me, Easter has always been the most meaningful of annual festivals. Why? Because whether you focus on the religious, or the nature and Springtime themes, the central idea is so optimistic and powerful: a celebration of rebirth and renewal. If things can always begin again, if things can keep growing, then there are also always two things: change and hope for something better. In short, improvement. Sometimes this improvement is incremental – in fact, that is the norm. But, then sometimes changes come that are not incremental, sometimes things move more rapidly, releasing held back demand in a sudden rush so that we get a revolution, i.e. a turning of ‘the wheel’ to a new position and old ways of doing things are ended and replaced. I’ve been working in the legal sector for exactly 20 years this month and the amount of change that has taken place has been staggering. Much of that change has been around the shape and structure of the market, the rapid development of new business models, and a huge increase in the complexity and range of support functions inside firms. It’s hard to imagine now, but at the time people freaked out when the merger news broke. Two such top tier firms merging to create an international powerhouse was extremely unusual. Then many other deals like that happened and it triggered a wave of global expansion and consolidation the likes of which lawyers had never seen before. Today, we live with the result. Also, firms were a lot smaller back then with relatively less resources, they had less leverage, far fewer paralegals, less salaried partners, and even taking into account inflation, equity partners made less money than today. The debate about whether law could even be considered a ‘business’ still had some mileage in certain quarters. Today, commercial law is lot more businesslike, it’s more like other parts of the corporate world. Firms have become much smarter about how to make money and have brought in every type of expert under the sun to help things run smoothly and meet changing needs, from pricing experts, to project managers, to now innovation teams and data scientists. But…..(and this is where legal tech comes in…..)….despite all of this immense change, it is only in the last few years that the way legal work is produced has started to change, and that is largely due to a bunch of ones and zeroes in the shape of software purposed for the legal world. And now we come back to the Easter theme as well. Right now, the law (at least in the commercial sector) is going through quite an incredible time again. It is literally renewing itself. How? Here’s a few thoughts. It’s tempting to use the term ‘renaissance’, but that means to repeat what has come before. What’s happening now is something different. The way that the legal ‘product’ is being made is moving to a whole new footing. It’s a revolution, albeit via software. And if this revolution succeeds, it won’t be the destructive kind, but rather the opposite. It will mean lawyers having more time to be real lawyers again, instead of swamped in administrative and low value tasks. That’s one of the main misconceptions about the use of technology in the legal field. It’s doing the exact opposite of replacing lawyers, it’s making them more valuable by allowing them to use their extensive skills and knowledge in a powerful way. No one should have to need 20 years of education, to study like maniacs, and pass a rigorous Bar exam in order to search for documents, underline key phrases, or collate unstructured data. It’s a terrible waste of human talent. Legal ‘admin’ and process work is not being a lawyer, no more than me spell-checking this article makes me a writer. If I spell-check all day it makes me a spell-checker. I.e you are what you do. But, back to the (software) revolution. It’s early days still, but in 2016 when Artificial Lawyer launched very few law firms were using AI doc review systems, for example, at scale. Today, there are literally hundreds of firms, as well as all manner of other legal businesses and inhouse legal groups using this technology if you add up every single company’s customer base. It’s happened that fast. There remains a huge amount to do, especially around the internal expansion of the use of such tools in each firm, but, we can’t have everything at once. Few firms until recently were really using their doc automation tech either, even if they’d bought a licence for it. That seems to have changed rapidly as well in the last few years. Then we have the expert systems, semi-automated deal platforms, KM tools that leverage AI, predictive systems, management data collection and analysis tools that use machine learning and more. Yet, this is just the beginning. Just look at the rush to build innovation teams and to hire in ‘hybrid’ talent across law firms’ other major support functions such as knowledge management (KM). It’s all happening, as they say. Also, legal tech adoption remains ‘difficult’. It’s not like buying an iPhone and within five seconds having the world at your fingertips. AI review isn’t perfect and even something relatively simple like doc automation can be time-consuming and clunky. Up front time investment is still quite heavy and that slows things down and deters others. But, it will get better. That’s one of the things about technology when there is a market need – it keeps improving. Why? Because there is a big reward for those than can improve it. Improvement is highly incentivised…! This week I was chairing a panel of experienced KM experts and one of the most noticeable aspects was the way they talked about technology. They used everything and anything that was useful and they took an entirely practical approach. They used DMSs, they used doc automation systems, they used AI technology to find what they needed across the firm, they used whatever worked, whatever was useful. And, when the discussion moved onto ways of automatically assigning values to extracted information so that they could know if what they’d found was useful or not, we ended up in an area where there didn’t seem to be a tech solution yet. But, if there was to be one they’d want it. Would that new and shiny thing be new and shiny? Yes, it would be. But, it would also be useful. So, they’d have it. The point here is that they didn’t divide tech up into categories of ‘shiny’ or ‘boring’ or anything else. All that matters is that, within sensible limits, the tool is able to add some value and get them closer to where they needed to be in terms of their task. At the moment we’re having something of a ‘reactionary’ moment in legal tech. The problem there is that we could end up turning some people away from new tools that are useful to them. It’s totally sensible to not want to be oversold to, but people do want new ways of solving problems, they do want to explore new tech, to run pilots on startup applications, and in some cases and where they have the resources to do it, even build their own technology. I don’t see anything wrong in reaching out to the new – if it can be useful. And the only way to find out if it’s useful is to try it out. What’s the alternative? Do nothing? Use only what you have already? That would be a sad and backward step. After talking to a lot of lawyers about tech adoption in recent years it seems that the central problem is a lack of a framework for deciding what they need, and even in some cases to know what tech they have already. Are there law firms with tech applications that they get little use out of because there have been barriers to use, e.g. a lack of time or staff to develop a set of automated contracts? For sure. Are there law firms that have applications that they only use a small percentage of because they’ve never really explored what they can do beyond the basics? Absolutely. And are there law firms that have piloted new tech without a good reason for doing so and then ended up not using it? Yes, there have been. But, this is not a failure of the technology. It’s the absence of a framework with a problem-focused approach for making the right choices. I.e. a means of legal tech triage. Is this the law firms’ fault? Not really either. When things move very quickly having the right decision-making systems in place is hard to do. It’s simply an effect of the way tech has arrived on firms’ doorsteps overnight. So, what’s the answer? To me, putting on my consulting hat, the answer has to be to work with law firms (and all legal functions and businesses) to utilise a framework for triaging their needs. This process could result in many different outcomes. It may very well lead to the conclusion that what a firm needs most of all right now is nothing to do with tech, but rather it’s a staffing or process issue. Likewise, it could mean making better use of what you have already. That is a real possibility and has to be considered. And, also, it could mean bringing in something very new, and super shiny. (Although soon enough it won’t be new or shiny once it gets used for a few months.) All three options are good. Why? Because all three scenarios are real and there is no harm in just accepting that reality. In short, we need to use what is useful. No one has a right to be a ‘gate keeper’ and tell firms they shouldn’t use X tool or Y tool if it looks like they could benefit from it, whether it’s new, old, exciting, boring, is connected to the cloud, a blockchain, or to a metal filing cabinet, uses machine learning, or an Excel spreadsheet. It’s all just a means to an end: solving a problem. My response will always be: do whatever works best as long as you have the resources and the people to get real value from that approach. These decisions need to be made within a broad, needs-based framework, but the conclusions that come out of it have to be respected, whether the end result is to do very little other than do more with what you have, or bring in new things, to pilot and then hopefully leverage to maximum potential. The (software) revolution in the legal world that is happening now is probably one of the most benign in history. It’s making lawyers’ lives better in the sense that they can focus more on real legal work. We should embrace it. Responsibly, yes. With a logical, real-world, needs-based foundation for assessing what people really can make use of, yes. But, ultimately also to embrace the new – in whatever shape it comes – and see it as part of the constant renewal of the way legal work is made. 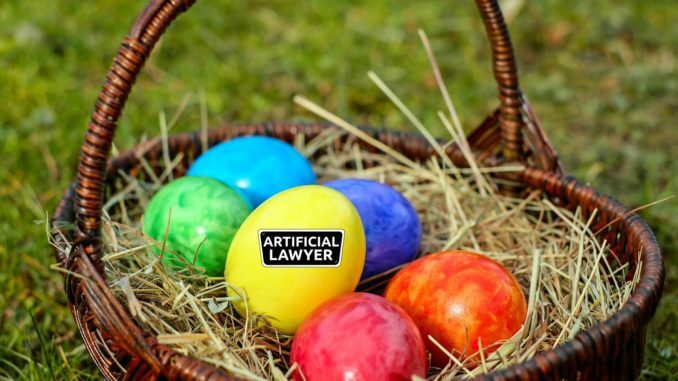 Richard Tromans, Founder, Artificial Lawyer + Tromans Consulting – April 2019. Enter your email to receive news alerts, plus info on Artificial Lawyer and 3rd party events.